I've had the opportunity to taste this wine on two other occasions and can honestly say that it's starting to really shine and become the wine that many thought it would be. The first time I tasted the wine about three years ago, it was no where near ready to drink and was far too massively structured and extracted to enjoy. It's quite possibly the boldest and most expressive wine from Montalcino to be made in the last couple decades. The color of this wine is still extremely dark and almost black, showing little signs of discoloration from age. 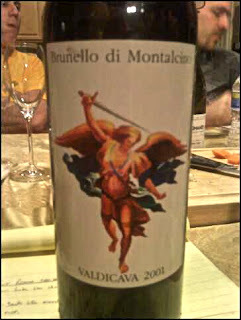 On the nose this wine is classically "Italian" showing a whirl of soil, leather, and hints of barnyard/brett character. There is also a solid core of black cherry, cassis, chocolate, vanilla, oak-spice, and dried raisin. When the wine opens up a bit more in the glass I get a slight hint of sweet tea and plum action appears as well. A complex and alluring bouquet to say the least! On the palate the wine is packed with dense tannin and sharp acidity, flavors of black cherry, blackberry, leather, milk chocolate, and black plum, all combine to form an intense and delicious drinking experience.